Vic is a city which has been driving several extra-local initiatives. It stands out as a city of fairs and markets, as a university city, as a gastronomic city, as a city with a rich historical heritage, or as a city which organises numerous cultural events. Here, various public cultural facilities come together, facilities which serve locals and visitors through exhibitions, through training, or through production projects with a presence in the city, but which seek to open up into a wider social and spatial context. It is a city of villages and towns of the region, and it is also the projection and relationships which reach out beyond its boundaries. It has a potential which combines production and cultural innovation with cultural heritage, quality gastronomy, landscape, commerce, history, all of those elements which lend the city its uniqueness. A city with the necessary ingredients to promote an initiative to position itself as a city of art. That is, a city with a significant artistic presence throughout the year, but which, during a certain period, expands this presence across different public and private spaces, to ordinarily unusual, inaccessible sites which, having been opened up and connected to artistic interventions, help to find new audiences, and to promote new stories, and new dialogues between spaces and art projects . This is why you should stop and look, listen, hear and enjoy the particular experiences. This is Parada Zero. 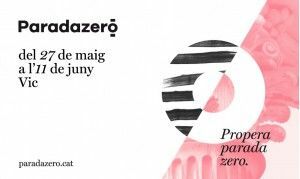 Parada Zero is an initiative promoted by various institutions and platforms working within the artistic context of the city, such as ACVic Centre d'Arts Contemporànies, Escola d'Art i Superior de Disseny de Vic, Exartvic, Museu Episcopal and Museu de L’Art de la Pell. Ajuntament de Vic, as part of of Vic Capital de la Cultura Catalana 2016, and in collaboration with the Departament de Cultura de la Generalitat de Catalunya, has made this first edition possible. A journey has started this year, the implementation of an activity which will be repeated annually, which will emphasise the energy of the arts when combined with the power of urban and architectural elements. Art and City come together in this temporary event, which also aims to become an annual event in which art takes on a significant presence, making a connection with specific sites and buildings within the urban context. Group and themed multidisciplinary exhibition, which will take place in an old shop within the old town centre of Vic, taking as its subject the ideal figure of the leader, mythology and heroism, in counterposition to the anonymous, the irrelevant and the mundane. With the participation of students and graduates from the Escola d'Art i Superior de Disseny de Vic. Exhibition organised by the Associació d'alumnes de l’Escola d'Art i Superior de Disseny de Vic. Performances and artistic interventions within a private space, and a self-publishing market at the Plaça de l'Estudiant. Curated by the collective Ex Abrupto. Four artistic interventions in different city places that project and work about the fragility, ambiguity and complexity. The participants are Ignasi Aballí, Andreas M. Kaufmann, Antoni Muntadas i Wilfredo Prieto. Project curated by Montse Badia. The artists open up their private creative and working spaces to different generations of artists so they can share interior development, converse and talk with the general public, make proposals and open themselves up to new narratives. Project curated by Exartvic. Facilitators Clara Rebollo and Pilar Sanmartin.